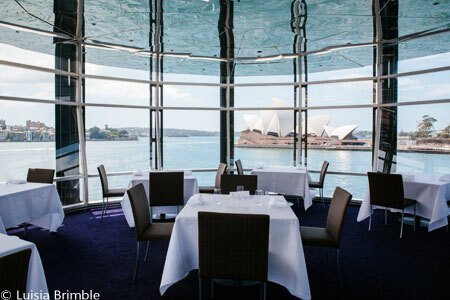 Breathtaking Sydney harbor views and food to match. : Executive chef Peter Gilmore’s restaurant has one of the best views in Sydney, but in the years that he has been at the helm, the food --- in flavor and presentation --- more than equals the surroundings. While the venturesome contemporary Japanese-leaning cuisine is exceptional, many diners pace themselves in order to enjoy the famous finale: his classic eight-textured chocolate cake or the snow egg. The set three- or four-course lunch menu features such a range of esoteric tastes and techniques that many feel they would need to dine several times to explore them thoroughly. By night (book well-ahead to secure a window seat), enjoy the four-course prix-fixe menu or the eight-part tasting menu. At either meal, consider dishes such as mud crab congee; slow-cooked abalone and smoked confit pig jowl; Blackmore Wagyu with black lentil miso and black garlic; and steamed King George whiting, sea scallop and southern squid. Quay’s international wine list offers an exceptional breadth of regions and styles, as well as half bottles and many wines by the glass. Careful selection is administered by no less than ten sommeliers. Seriously romantic territory, with a sightline to Sydney's jewels --- we’re talking Sydney Harbour Bridge, the harbor itself and Sydney Opera House --- this is a Big Date destination.